Whooping cough is a highly contagious respiratory disease caused by Bordetella pertussis. Despite widespread vaccination, its incidence has been rising alarmingly, and yet, the physiology of B. pertussis remains poorly understood. We combined genome-scale metabolic reconstruction, a novel optimization algorithm, and experimental data to probe the full metabolic potential of this pathogen, using B. pertussis strain Tohama I as a reference. Experimental validation showed that B. pertussis secretes a significant proportion of nitrogen as arginine and purine nucleosides, which may contribute to modulation of the host response. We also found that B. pertussis can be unexpectedly versatile, being able to metabolize many compounds while displaying minimal nutrient requirements. It can grow without cysteine, using inorganic sulfur sources, such as thiosulfate, and it can grow on organic acids, such as citrate or lactate, as sole carbon sources, providing in vivo demonstration that its tricarboxylic acid (TCA) cycle is functional. Although the metabolic reconstruction of eight additional strains indicates that the structural genes underlying this metabolic flexibility are widespread, experimental validation suggests a role of strain-specific regulatory mechanisms in shaping metabolic capabilities. Among five alternative strains tested, three strains were shown to grow on substrate combinations requiring a functional TCA cycle, but only one strain could use thiosulfate. Finally, the metabolic model was used to rationally design growth media with > 2-fold improvements in pertussis toxin production. 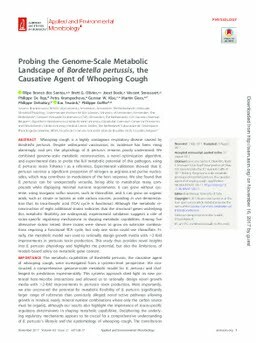 This study thus provides novel insights into B. pertussis physiology and highlights the potential, but also the limitations, of models based solely on metabolic gene content.